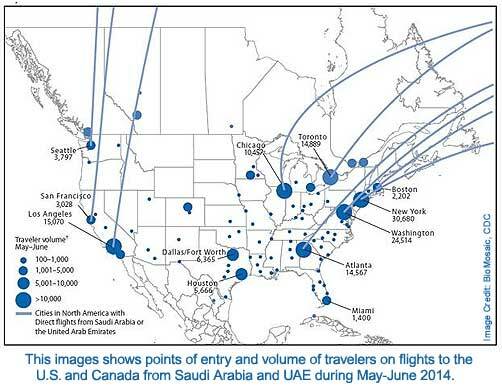 5/12 (b) – CDC: 2nd MERS case a healthcare worker who flew SA Flt 113 from Jeddah > London > Boston > Atlanta. Now hospitalized in Orlando. 500+ exposed & being notified. 5/12 (a) – CDC: 2nd confirmed US case of deadly Middle East Respiratory Syndrome Coronavirus (MERS-CoV). Florida patient. Awaiting more details from 2:00 PM press conf. Twice this week AlertsUSA subscribers were notified via text messages to their mobile devices regarding a 2nd confirmed case the deadly Middle East Respiratory Syndrome Coronavirus (MERS CoV) here in the U.S.. This week’s case also involved an individual who traveled from Saudi Arabia through via flights through London, Boston, Atlanta and into Orlando. CDC’s Div. of Global Migration and Quarantine is working with Pan-American Health Org. (PAHO), Public Health England, Public Health Agency of Canada, and U.S. state and local public health authorities to contact and interview all travelers that may possibly have been exposed to the Florida patient between when he left Saudi Arabia and was ultimately diagnosed and quarantined here in the U.S..
As of May 12, 536 laboratory-confirmed cases of MERS-CoV infection across 18 countries have been reported by the WHO, of which 145 have died. All reported cases have been directly or indirectly linked through travel or residence to seven countries: Saudi Arabia, UAE, Qatar, Oman, Jordan, Kuwait, and Yemen. As previously reported by AlertsUSA and Threat Journal on multiple occasions since the virus was first identified in the Spring of 2012 (see this and this), public health and epidemiology professionals tend to cringe each year when the annual Hajj pilgrimage to Mecca rolls around, planned this year for the first week in October. It goes without saying that when millions of international travelers from all points on the globe converge in one city for a physically active, horrendously overcrowded, hot and humid gathering involving communal shaving, touching common surfaces and staying in tightly packed quarters, one is considered lucky to leave without having contracted some respiratory or digestive bug, if not worse. Even a cursory search of the Internet shows that cholera, pneumonia, meningitis, all forms of hepatitis , measles, mumps, typhoid, dysentery and a host of other communicable diseases run rampant during the Hajj. Then the Pilgrims, just a quickly, return to their countries of origin. While this year it is widely reported that camels appear to be the primary hosts for the virus, listeners may recall that in 2012 and 2013, health authorities were reporting that genomic analysis suggested that the coronavirus circulated among bats before jumping to humans. On Wednesday the World Health organization reported that while concern about the virus had “significantly increased,” the disease was not yet a global health emergency. Late this week Saudi health authorities reported 20 new cases as well as 10 more deaths. Despite the WHO statement, 22 international airports across the U.S. this week began prominently displaying health advisory posters from the CDC warning of the MERS virus. In addition to educating travelers about the symptoms of MERS, the posters warn those who travel to the Arabian Peninsula (including Bahrain, Iran, Iraq, Israel, Jordan, Kuwait, Lebanon, Palestinian territories, Oman, Saudi Arabia, Syria, the United Arab Emirates, and Yemen) to wash their hands often, avoid touching their face, and to avoid close contact with sick individuals. In public health emergencies, officials will ALWAYS downplay a threat so as to minimize panic. Thus, while it is important to follow what officials SAY, it is equally important to watch what the professionals actually DO. In principle, it is the current understanding that the MERS-CoV can be transmitted by three routes: aerosols, large droplets, and direct contact with infected surfaces and secretions. One of the best risk mitigation steps you can take is to acquire a medical grade skin and surface cleanser. 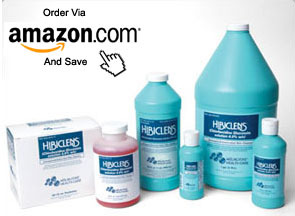 One of the gold standards in hospitals and other clinical settings is Chlorhexidine Gluconate, which is sold under the product name HIBICLENS. The product is intended for use as a surgical scrub and personnel hand wash, a patient pre-operative skin preparation and a skin wound cleanser. The antimicrobial cleaner bonds to the skin to create a persistent antimicrobial effect and protective germ-killing field against a wide range of microorganisms. An ESSENTIAL risk countermeasure for reducing the spread of MERS-CoV, not only for caregivers but also for the sick, is to acquire a supply of N95 particulate masks. 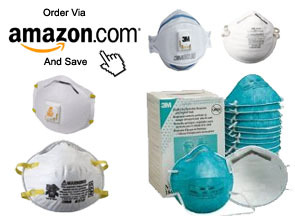 The N95 respirator filters at least 95% of airborne particles, is in wide use within hospitals and will be impossible to find during a any major disease major outbreak or pandemic. These are (currently) inexpensive and a critical element for one’s preparedness supplies. AlertsUSA continues to closely monitor the overall situation with the spread of the MERS virus and will immediately notify service subscribers of reports of new U.S. cases or the release of updated information from health authorities indicating an increased threat environment as events warrant. 5/12 US STRATCOM begins major nuclear arms drill involving cross spectrum DoD resources. Expect heightened security + gate delays at mil bases nationwide & abroad. 5/17 Overnight: USGOV issues travel alert for Thailand, partic Bangkok, due to political & social unrest over gov corruption. Avoid all protests, vigilance urged. 5/13 – Russia to end operation of all 11 U.S. GPS stations on Russian territory on 6/1, + bans U.S. use of Russian rocket engines for defense satellite launches. On Tues of this week AlertsUSA subscribers were notified via text messages to their mobile devices regarding Russia’s response to the latest round of economic sanctions. According to Russian Deputy Prime Minister Dmitry Rogozin who is himself a target of U.S. sanctions, Russia will ban the U.S. from using Russian-made MK-33 and RD-180 rocket engines for launching defense satellites. The engines are used to power Atlas V rockets lofted by United Launch Alliance LLC, a joint venture between Lockheed Martin Corp. and Boeing which is currently the sole supplier of rocket launches for the Pentagon. A day after Russia’s threat, Pentagon spokesman Col. Steve Warren revealed that United Launch Alliance has a two-year supply of the engines already in hand. Rogozin also told reporters that Russia will not be extending its role in the Int’l Space Station beyond 2020, thus indirectly threatening the taxi service for U.S. astronauts. He also stated that Moscow would switch off 11 U.S. Global Positioning System satellite ground stations in Russia on June 1 unless the U.S. allows placement of similar stations in the U.S. for Russia’s competing Glonass system. It is reported that the loss of the GPS stations across Russia would result in a decrease in system accuracy in the region. Late this week the Kremlin announced it would be holding a large military drill involving dozens of fixed wing fighter aircraft and attack helicopters within the three military regions directly on the border of Ukraine in the days leading up to and on the day of Ukraine’s national elections (May 25th). On Friday NATO kicked off a major military exercise in Estonia involving 6000 troops from nine countries. Known as “Steadfast Javelin 1” the exercise is based on a fictitious scenario and involves allied forces repelling an attack on Estonia. Participating units include an extensive array of air and ground forces. Reports are emerging regarding some type of attack on one of Ukraine’s nuclear power facilities (see this and this). Given the experience of the country with the Chernobyl disaster, one can logically assume that authorities would intentionally downplay / distort / alter / or otherwise intentionally misrepresent the details so as to prevent panic. We remind readers that just one week ago, Threat Journal reported that NATO had deployed security advisers to Ukraine to specifically address security issues at the country’s nuclear power facilities. AlertsUSA continues to closely monitor the increasingly tense situation in Eastern Europe and will immediately notify service subscribers of changes in the overall threat environment, major escalations and force deployments or the outbreak of hostilities as events warrant. The Last Days As We Know Them? Beats the hell out of confiscating our guns! The sweeping gun-rights bill that has been winding its way through the past two legislative sessions in the Georgia state legislature passed in the last hours of the current session. The bill, HB060, legalizes the use of suppressors for hunting in the state and allows guns in several areas that previously were off limits, such as in unsecured areas of airports. “The House has finally come along for Georgia’s gun owners,” said Sen. Bill Heath, R-Bremen on the legislation. House Bill 60 was introduced into the state House over a year ago before finally passing that body on Feb. 13, 2014 by a landslide 167-3 vote. Then followed a month of being passed back and forth between the Georgia House and Senate with various amendments clarifying the measure’s sections on legalizing suppressors and allowing guns in churches. The House, sending the bill to the governor’s desk, confirmed the final version, which passed the Senate on Mar. 18 by a 37-18 vote, Thursday. One of the few changes in the final bill from the original version included dropping language that would have allowed guns in churches. Instead, unless a church itself expressly allows guns on its property, it will remain illegal. Meanwhile. those in the firearms industry noted the bill’s inclusion of suppressors, which would now be legal for hunting in the Peachtree State. Legislation backing expanded use of suppressors as well as increases in concealed carry laws have been sweeping the country in recent months. South Carolina’s governor signed a new law in February to allow carry in bars and restaurants that serve alcohol whereas North Carolina greatly expanded their concealed carry laws in 2013. House Bill 60 now heads to the desk of Georgia Gov. Nathan Deal (R) for signature. The post Massive Georgia gun-rights bill passes legislature at last minute (VIDEO) appeared first onGuns.com.